This weekend is the Cape Argus Pick n Pay Momentum Cycle Tour (the official name is getting longer and longer) and the city is filling up with 35 thousand energetic riders who need to carbo load for this world famous race. Oatcakes are a really good source of energy and easy to make. They are great with cheese if you are trying to cut out bread. I tried to find a French connection to give me a reason for making them my recipe of the week for the cyclists but to no avail, they are definitely of Scottish origin. In the 14th century during long marches, Scottish soldiers would mix some oatmeal with water and cook these simple cakes on their shields over a fire. 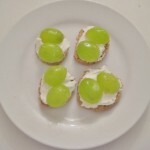 So to add a French connection I baked some and added Petit Suisse (fresh cream cheese) on top with some recently harvested green grapes, absolutely delicious. I also baked some with grated, 24 months old parmigiano reggiano, these can be packed and taken in a back pocket on the Cycle Tour to eat as a snack. Preheat oven to 150C degrees If you use rolled oats then put them in a kitchen blender and blend until reasonably fine. Split the oat meal into 2 equal portions in separate mixing bowls. For the savoury cheese oat cakes: In the first portion of oat meal, add a ½ teaspoon of salt, the grated parmigiano and mix together with your hands. Add 1 tablespoon of olive oil and mix well together. Slowly add a spoonful of luke warm water at a time to the oat mixture and mix together until the mixture forms into a dryish ball. Use as little water as possible. For the plain oatcakes Add a ¼ teaspoon of salt to the other half of the oatmeal and mix in with your hands. Add 1 tablespoon of olive oil and mix in. Slowly add a spoonful of luke warm water at a time to the oat mixture and mix together until the mixture forms into a ball. Use as little water as possible. For both mixtures roll each ball with your hands and either roll out very thinly and cut into round biscuit shapes; or make the ball into a shape like a fat sausage, slice this with a sharp knife to make thinnish rounds. Put these rounds on a greased baking tray (in case you don’t have a Scottish shield in the kitchen) and flatten the rounds with your hand as much as possible. Bake for 30 minutes until crisp. 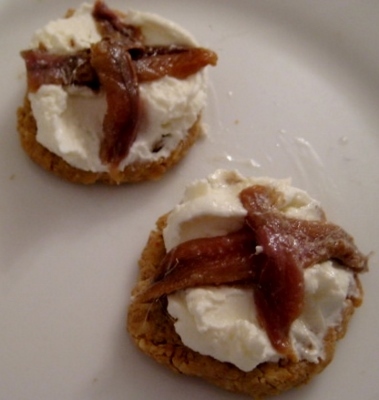 The cheese oatcakes can be eaten on their own or topped with butter or a slice of cheese. 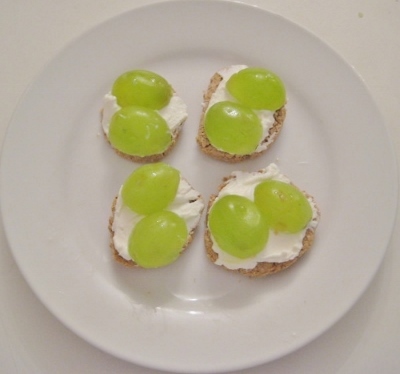 The plain oatcakes can be topped with a spoonful of Petit Suisse and sliced green grapes.